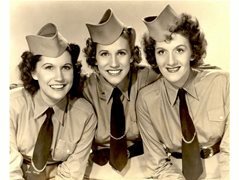 I am a London- based singer/ keyboardist looking to join female vintage vocal harmony trios, in the likes of the Andrews Sisters, the Chordettes, the Belle Noir. I am a musician, therefore I can read music, follow different melodic lines and I am confident learning basic dance routines as part of the performance for gigs. I don't have any tours or cruises lined up in the near future and I am looking for committed musicians. No time wasters, more information will be provided to the right applicants. Looking to join female vintage vocal harmony trios.